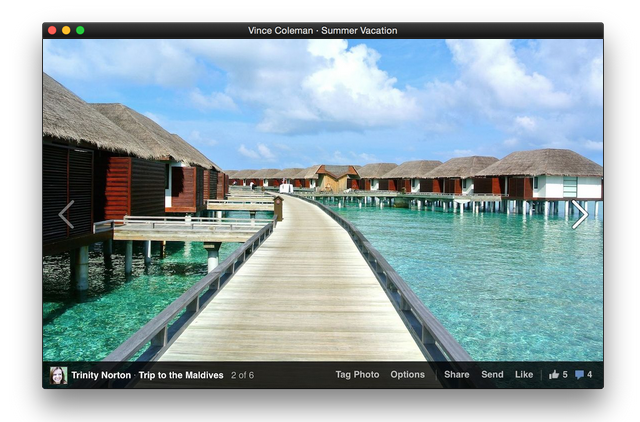 A recently launched app called Current turns Facebook into a native application for the Mac desktop. The app offers an alternative to regularly (or perhaps obsessively?) checking the Facebook site in an open browser tab, with support for Facebook Messenger, photos, videos, customizable notifications, and more. Current is effectively a replacement for using Facebook via the browser, creator Scott Kyle explains. Kyle previously worked at Apple on iOS WebKit and iAd frameworks, so he knows a little something about Apple’s design aesthetic and that shows in Current. With Current, Facebook feels almost like part of the Mac OS X user interface, with a shortcut in Mac’s menu bar for accessing your buddy list, inbox and notifications. The app also lets you customize these notifications so you can minimize distractions while you’re trying to work. And when you’re ready to respond, each conversation pops out into its own window, allowing you to drag it around your desktop and place it anywhere you like. The Messenger experience supports group chat and stickers and access to your “Other” inbox – like you would have if you were browsing Facebook on the web. You can also pop out photo albums and swipe through them, as well as pop out videos, allowing you to watch while you do other things. Meanwhile, the app’s built-in Facebook browser lets you still enjoy surfing through Facebook, but in a dedicated app that supports tabs – and it lets you return to where you were last in the feed, so you’ll never have to lose your place. As for why anyone would need a dedicated app for Facebook on their Mac? Well, if you’re not sold on the app’s little touches like the pop-out albums, for example, there’s the added benefit of still being connected with your friends without continually getting sucked into the Facebook experience and wasting time. Browsing Facebook on the web can be one of those things that can eat away at your day and can kill your productivity. Some users even get so fed up with the distraction of Facebook and the “drama” of it all, they temporarily suspend their Facebook accounts. Current offers another option. With chat, notifications and friend requests in the menu bar and Mac OS X Notification Center, you can stay in touch without having to constantly check in on Facebook. The app is a $1.99 download on the Mac App Store.